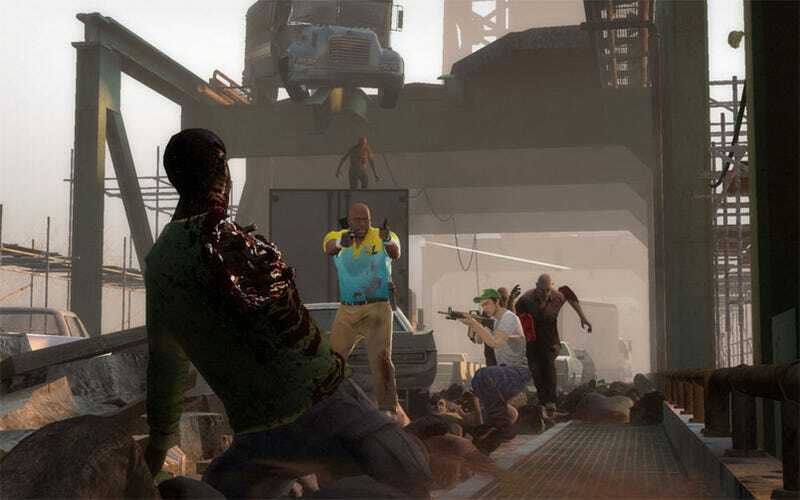 Valve showed off the final two levels of Left 4 Dead 2 campaign The Parish this evening, revealing how the game's four new Survivors will get the hell out of New Orleans. It also showed a brand new uncommon-common infected. Similar to the hazmat suit-wearing infected that are immune to incendiary fire, a new, mostly bulletproof infected will join the mix in The Parish. Seems a few riot police wearing full gear couldn't escape the zombie apocalypse, making the escape a little harder for Coach, Ellis, Nick and Rochelle. These kevlar wearing infected can only be killed from behind, making it especially difficult if two are bearing down on your character. A quick melee hit will stun them, even knocking them down and exposing their posteriors. But as they charge you, unloading a full clip on their fronts will essentially do nothing. Not sure how well molotovs, pipe bombs and other explosives will work, but we hope they'll do the work they're known for. It's a nice addition to the zombie arsenal, which should make the hordes, normally easily mowed down, a little harder to contend with.